Life will always throw up those testing moments when we have to deal with stress and for some it’s something that they have to deal with on a daily basis. People find different ways to deal with their stress and some of those ways may be healthier than others! Acupuncture treatments can offer great benefit for stress reduction and helping to sleep but you can’t go see your acupuncturist moments before your big presentation or when your child decides to doodle all over your freshly painted walls. 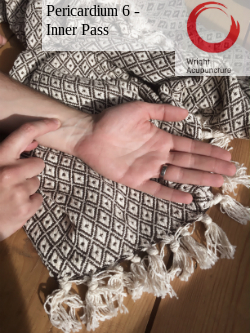 These 5 Acupressure points below can be used to treat yourself and are a great and healthy tool to help reduce stress and help you get a good nights sleep. Location: Apply pressure with your thumb at the point where your wrist forms a crease with your hand on the little finger side. Location: In a depression below the base of the 1st Metatarsal Bone at the junction of the red and white skin. A great point for reducing stress is Spleen 4. The Spleen is associated with the digestion of food as well as the processing and digestion of thoughts and experiences. Treating the Spleen to reduce excessive rumination and quiet an overly analytical mind can be very useful in easing stress. 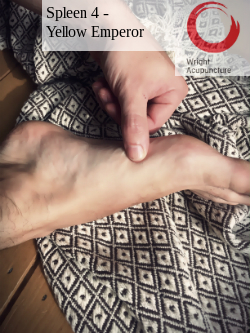 I have found Spleen 4 to be the most effective point on the Spleen channel, the location of the point, on the inside of the foot, contributes to its stress-lowering quality. Location: Starting from the wrist, measure down with three fingers as shown in the picture to the right. 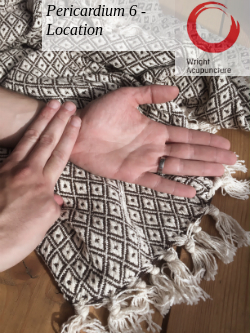 Where your third finger touches the middle of your wrist is the acupressure point. Take your thumb and apply firm pressure to this point until you feel some mild discomfort. Only apply enough pressure to have some sensation but not too much that it causes pain. 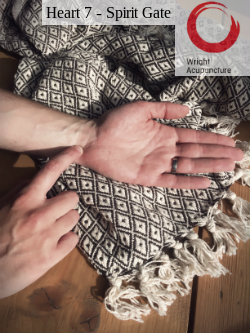 Hold this pressure point and gently knead your thumb in a tight circular motion for about 2 minutes. Do this to both wrists and you will feel your anxiety descend immediately. This point is also good for nausea! This point should be stimulated using the thumbs. 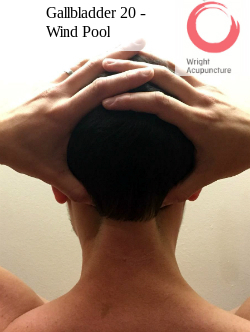 Press your thumbs gradually and firmly under the base of your skull for 1 minute keeping your eyes closed and leaning your head back. You will feel an even pulse on the points. Location: Midway between then ends of the eyebrows. Gentle Stretching – Before you try to go to sleep, gently stretch your arms, legs, side-to-side bends, and massage your shoulders and neck. Eye Stretches – With your eyes open, move your eyes slowly in a large circle – three times in each direction. Repeat this slow eye rotation with your eyes closed while breathing deeply. End by stretching your arms up and back as you take a few deep breaths. Induce Yawning – Exaggerate several yawns, as you stretch your arms and legs. Deeply Relax – Nestle comfortably into a very relaxed position. Take several slow, deep breaths as you enjoy relaxing. Focus on taking slower and deeper breaths. Let yourself completely relax.